Here is a place to post links or ads we find for Royale cars & parts for sale. Description: 1931 REO Royale Victoria coupe parts: runningboards, gauges, springs, door handles, frame covers, wheels, tires, caps, radiator, much more, everything $3,000; you pick up. 423-272-9788, TN. 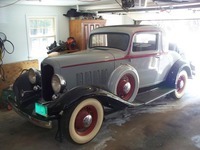 Description: Reo 1932 Royale sedan, 50-year barn find, very complete, extra wheels, great quality classic for restoration, $18,000 obo or trade; call for info. Bob, 559-905-5926, CA. Do you think this category would merit its own board? The advantage of a standalone board is we could have threads about each ad for discussion. On the other hand, I'm not sure how many cars will come up for sale in a given year anyways so I guess I'll leave it up to you. I'm fine with either. However, if we leave it a single thread could you make this one a sticky? I don't have that button. That is a good point. I think for now we can leave it as a single thread. You should have the ability to sticky as you have the same level of privileges that I do now. Yes. I see it now, under "actions". Thanks. CAR PARTS WANTED , I need the chrome piece on the top of the hood and hood latches for a Royale 8 - 31 . I understand they are the same for the 8 - 35 . A J are you referring to the rounded hood ornament that is on the front of the radiator cowl? If so I did not know anyone was repro-ing that. 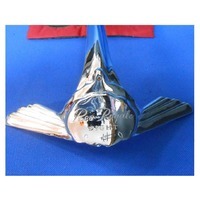 The hard to find piece is the chrome piece about a foot long that sits near the windshield on the cowl (it has a jagged end). Here is a picture of what he is selling. Master cylinder which is shared with the Model J Duesenberg. 250.00 buy it now on eBay. Back around 1960 my dad bought a dozen NOS internals for these from the Hupp/Graham factory in Auburn Indiana. Many Auburn/Cord/Duesenberg parts had been mixed in when the factories were combined. I used the last one on my car. I thought this was kinda neat. 1933 Flying Cloud 3 window coupe. 26,500. It is about an hour and change from me if anyone is really interested I could take a look. I think compared to a Dodge/Plymouth/Pontiac 6 with same body it might be a tad high given the condition. I'm not sure if the Reo gets a premium for being rare or a minus for being unknown. Royale NOS Headlight Lens, Pair.